At least you can say the Roseanne reboot lasted longer than most members of the Trump administration. Only a couple of months after the premiere aired to one of the biggest TV audiences in years, the revived sitcom has been cancelled, following racist tweets by its eponymous star. When the reboot of Roseanne was announced, most wrote it off as 90s nostalgia by a TV industry out of fresh ideas. But it was quickly claimed as a political victory by conservatives who saw the show’s portrayal of white working-class Trump-supporting America as a form of mainstream validation. Roseanne is far more than just a sitcom for a lot of Trump supporters – the show, along with its controversial star, is a symbol of what they stand for. Its cancellation comes as a blow to conservatives who had felt vindicated by the show’s huge viewing figures. But many vocal rightwing personalities were quick to rush to Roseanne’s defense, often employing, as Lahren acknowledged, a variety of mental gymnastics to argue that the comedian’s tweets weren’t racist. Barr’s tweet had said the former Obama White House adviser Valerie Jarrett was the “baby” of “Muslim brotherhood & planet of the apes”. Nugent’s denial of the racist connotations of comparing an African American woman to an ape was common among avowed Trump supporters. Bill Mitchell, one of Trump’s most prolific supporters on social media, tweeted that, in the Planet of the Apes, the apes were superior and so comparing Jarrett to an ape was not racist. Mitchell deleted the tweet shortly after posting it. During a Fox News panel, Noelle Nikpour, a Republican strategist, said the comedian was fired because “we live in a politically correct world right now”. And Alex Jones, who is currently being sued for spreading a conspiracy theory that Sandy Hook was a hoax, railed against the “THOUGHT POLICE”. In the past 24 hours Barr had also tweeted the false rumour that Chelsea Clinton is married to a relative of George Soros. Soros has become a favourite villain of the alt-right, and one that often inspires antisemitic dogwhistle tactics. “This is what happens when you speak out against the mainstream media and George Soros. They attack you from every corner trying to destroy your life,” tweeted Peter Imanuelsen, a Swedish commentator who has previously said the LGBT people should be killed and denied that that holocaust happened. Similarly, Lauren Rose, a self-proclaimed white nationalist with a large following, insinuated that Roseanne was only called a racist after her tweet about George Soros because of “an obvious smear job for challenging the authority of the media”. BREAKING: ABC has said that they are cancelling @therealroseanne show. This is what happens when you speak out against the mainstream media and George Soros. They attack you from every corner trying to destroy your life. Sykes, who was a writer on the show, announced she would not be returning for another season after Roseanne posted her tweet but before ABC had announced the show was being cancelled. 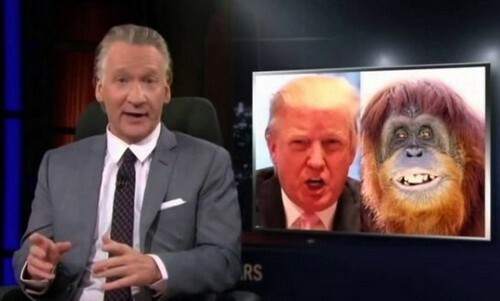 A picture of Bill Maher comparing Trump to an orange orangutan was also widely circulated, and a cry of “double standards” was repeated more than any other – despite the long history of using rhetoric around apes to dehumanise black people. No media are asking questions. Roseanne did not call VJ an “ape” as the media is misreporting. Trump himself is a big fan of Roseanne, and called the comedian to personally congratulate her on the show’s “huge ratings” after the first episode aired.